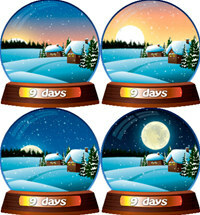 Smoothly animated christmas globe with a real sun, the moon, the sky and snow. You can see as the day gives way to night, as the sky changes color and the stars appear in the sky and the moon rising. Live christmas globe shows you the number of days remaining till christmas or new year. Live Christmas Globe is a desktop program that works under windows xp, windows vista and windows 7. It supports both 32-bit & 64-bit windows editions, therefore it could run faster on 64-bit computers. It is Free so you can download it and share it with your friends. Estimated download time for Live Christmas Globe on a common adsl connection is less than a minute. Version 1.1 was released one thousand nine hundred seventy five days ago by Drive Software Company. Click the green download button to download it now.